Ashton attended the Florida Coastal School of Law in Jacksonville, Florida after graduating from Marshall University in 2012. She passed the West Virginia Bar Exam in 2015 and was admitted to the Bar the same year. 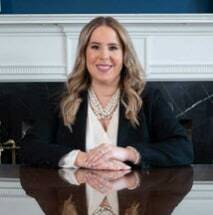 Ashton joined the Lyne Ranson Law Office team as an associate attorney in 2015 after serving as a summer law clerk there during her second year of law school. Ashton is excited to return to her home state, serving the people of West Virginia as a family law attorney. Her practice focuses on custody, adoption, guardianship, divorce, and child support. "Most people recognize the powerful emotions which accompany each family law case. That emotion is what drives my desire to practice family law. My passion is being there and fighting for people and their families who are experiencing some of the most difficult times of their life. For me, family is everything, and there is no job more rewarding than mine." In her spare time, Ashton enjoys traveling, hiking, catching up with her sorority sisters, and spending time with family and friends. She lives in the South Hills neighborhood with her boyfriend, Ray Harrell, Jr., and their two Cavalier King Charles Spaniels.